Happy day, my friends! 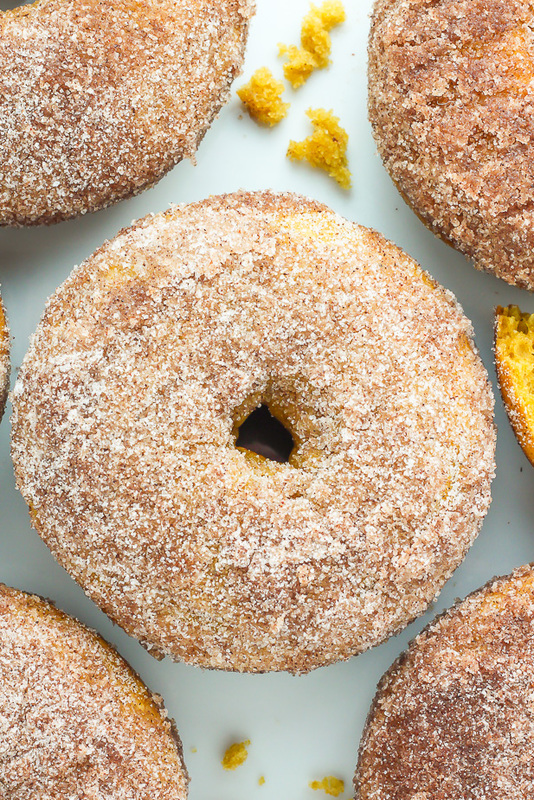 Today is all about pumpkin, sugar, and DONUTS! 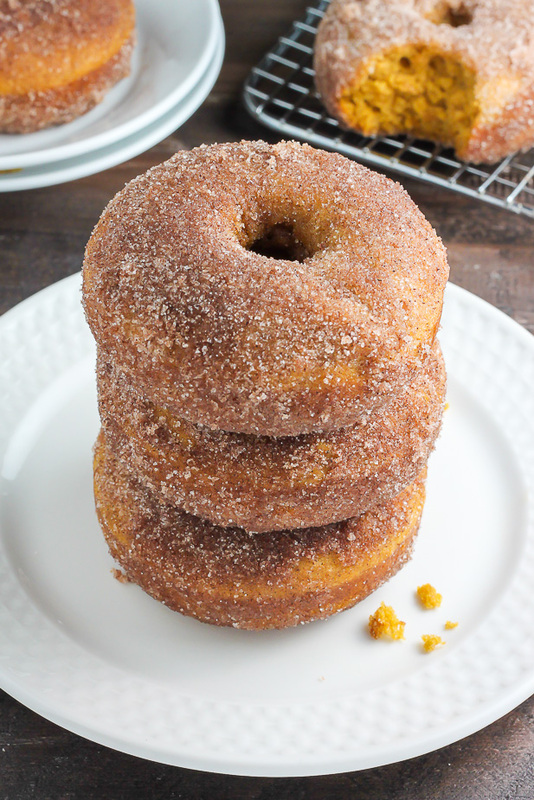 Confession: I’ve been dreaming about these fluffy pumpkin cinnamon sugar donuts since JUNE. What can I say? My pumpkin loving heart knows no seasons. Then again, I’m the girl who made blackened chicken ramen noodle soup in July… so maybe all of this is no surprise? So here’s the nitty gritty on what you’ll need to make these dreamy donuts a reality! For the dry ingredients you’ll need all-purpose flour, brown sugar, baking powder, and salt. For the wet ingredients you’ll need milk (or almond milk), pumpkin pie puree (yes, the one with the spices already added in), and melted butter (or liquified coconut oil). You’ll also need granulated sugar and ground cinnamon to make the cinnamon sugar coating. 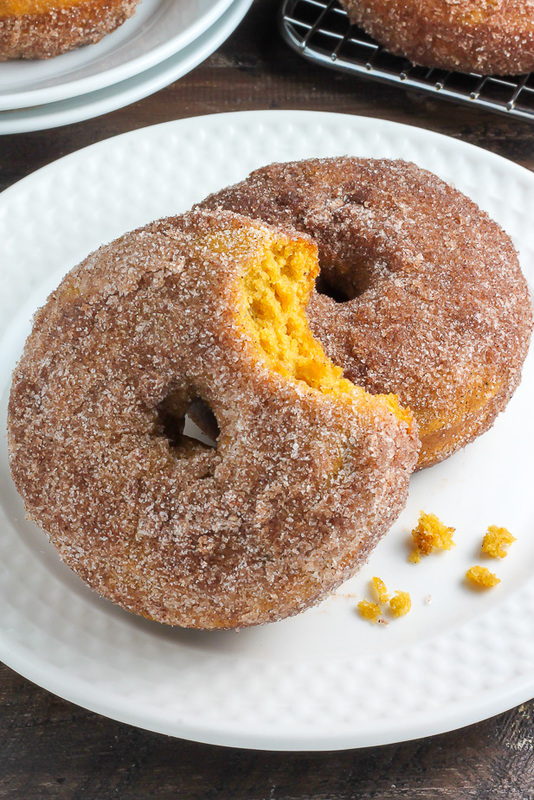 I thought about adding a drizzle or glaze to these donuts, but after test-tasting batch after batch, I decided to allow the natural charm of these pumpkin donuts to shine on their own. Sometimes less is more, ya know? A few years ago I tackled vegan baking and you guys seemed to really dig it. So today I’m offering you TWO recipes below. 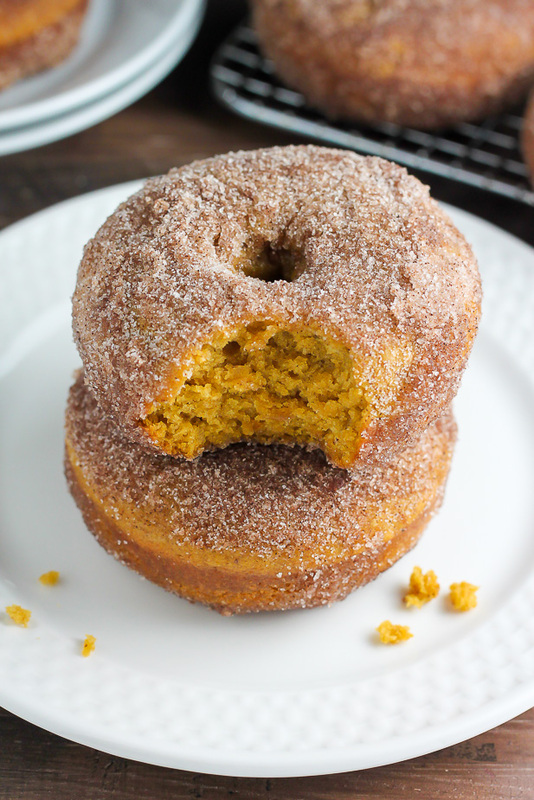 The first being a traditional baked pumpkin cinnamon sugar donut and the second being a VEGAN baked pumpkin cinnamon sugar donut. I made both batches for a party last weekend, placed them on the same platter (don’t worry – no one at the party was vegan!) and guess what? None of my friends mentioned tasting a difference between the two. Both versions are sweet, fluffy, and suuuuper addicting! P.S. If you’re just dipping your toes into the baked donut game and are shopping for a donut pan, here’s the one I have been using for the past 3 years. It’s considerably cheap, very sturdy, and well, I just love it! Moist and fluffy Pumpkin Cinnamon Sugar donuts are baked, not fried, and ready in just 20 minutes! Gently fold the wet mixture into the dry mixture - don't over mix! Pumpkin pie puree can be found in most stores. If you can only find pumpkin puree, be sure to add 1/2 teaspoon ground cinnamon, 1/4 teaspoon ground ginger, 1/4 teaspoon ground nutmeg, and a pinch of cloves to the dry ingredients. I was just thinking to myself the other day – I really need to make use of my donut pan! These look like the perfect way to do just that AND welcome my favourite season! Bust that pan out, girl 😉 Fall is my favorite season, too! Hi Laura! Yes, no eggs in this recipe. Made them for grandkids this morning …. LOVED them!!!! Are these gluten free? Either recipe? Hi Cassie. No, neither recipe is gluten free. However a gluten free 1 for 1 flour may work. Can this batter be put in muffin pans? Hi Lili. I’ve never tried, so I cannot say for sure. If you do try, be sure to increase the baking time, as muffins take around 20 minutes typically. Please let us know if you give it a try! Concerning your donut pan. You say, “here’s the one I’ve been using for the past 3 years…”, but did not mention brand. Is it perhaps Wilton, or some other brand? Hi. The photo link for the pan I use is right below that comment (Norpro brand). If you’re still not seeing the link, please let me know and I’ll send it to you. Any replacement if I don’t own a donut pan? It this dough bread-like enough to roll out and cut and hold it’s shape? Hi Kelley. 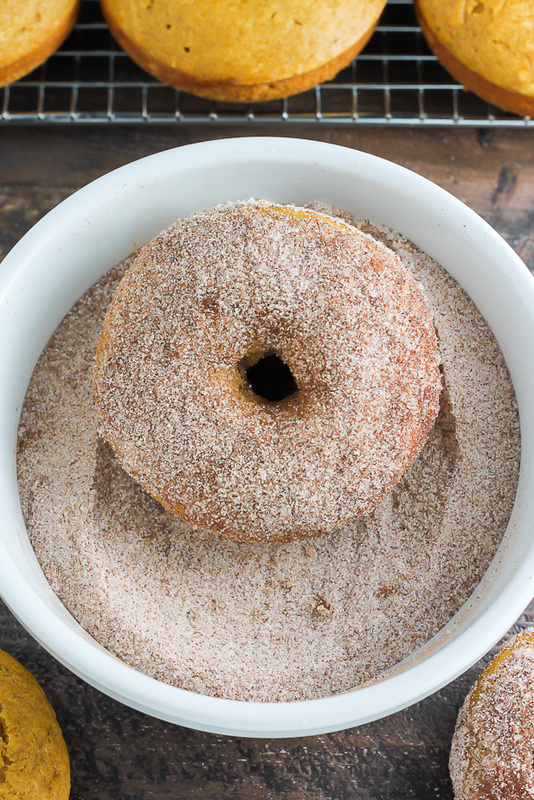 This recipe requires a donut pan. The batter is too thin to hold shape. Best vegan donuts I’ve had and so easy to make. I used cake flour and sifted the dry ingredients but other than that I used the exact recipe and it was great. Thank you! SO happy to hear it, Elana! Hi Juls. The texture will likely be more dense if you sub whole wheat flour. I just used whole wheat flour, and they still were light and fluffy! Can I make these in one of those baby cakes donut makers? Can you use regular pumpkin in a can instead of pumpkin pie purée?? Made these this morning. Super easy, and really tasty. Made a double batch, because why not? 🙂 Thanks the recipe! OMG! I have made six of your donut recipes so far. All amazing but this one is hands down my favorite so far! 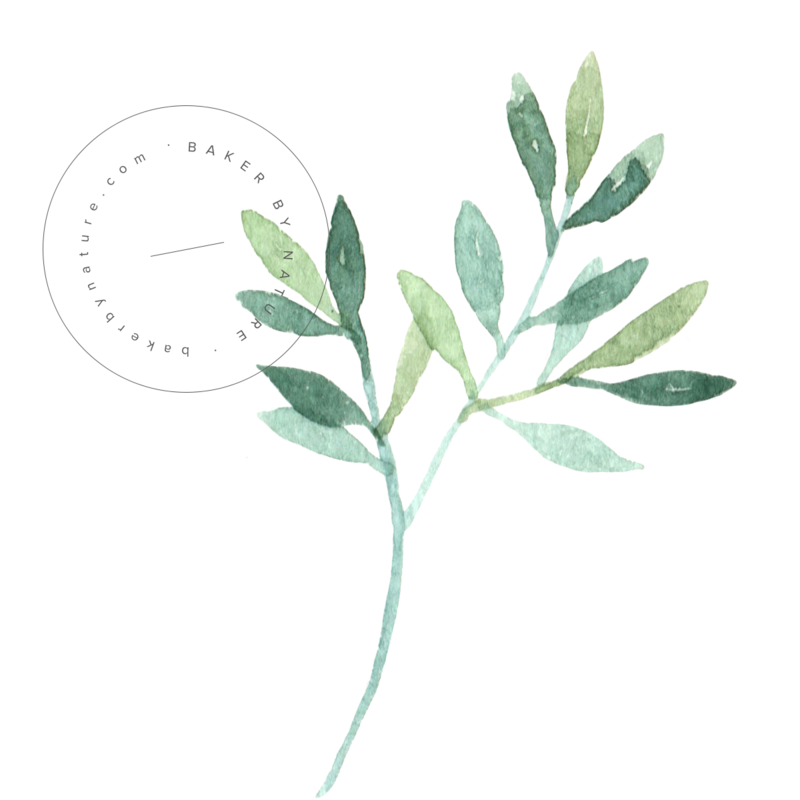 Addictive. YUMMO!!!!!! Hi Diane. I’m so sorry you were disappointed with the amount of pumpkin flavor in this recipe. 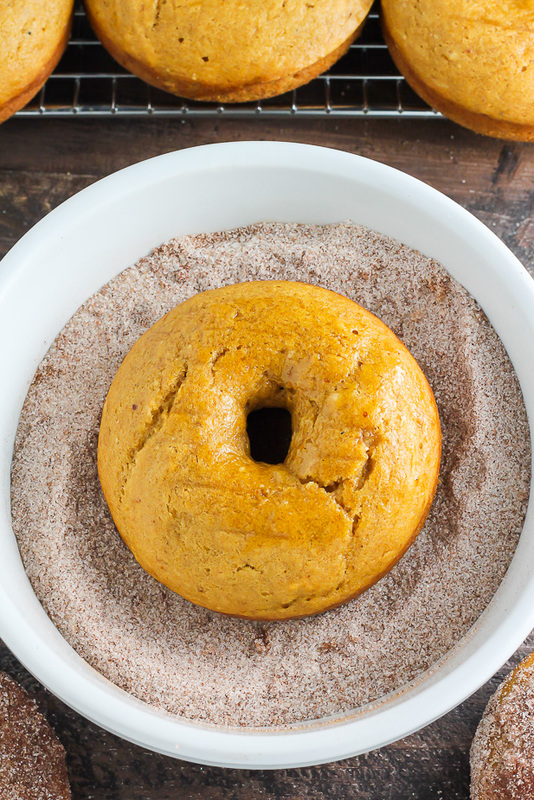 Unfortunately pumpkin is tricky to bake with, and adding more than the called for amount in such a small scale recipe would lead to gummy donuts. Just pulled these bad boys out of the oven and the tops are flat and lumpy instead of perfectly rounded. Any suggestions on how I can fix that with the next batch? Regardless, they smell and look delicious, so they’re gonna be devoured! I I put the dough in a zip lock and squeezed it out to the pans. It made them perfect shapes. Made these this morning they turned out wonderful. Delicious. I will make them many more times. 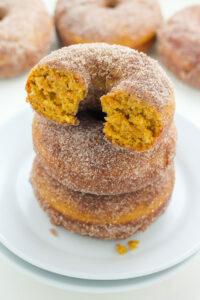 I only did the cinnamon and sugar on the top so I could taste that pumpkin and not just cinnamon and sugar. Thanks for sharing. I made this recipe yesterday. It was a nice easy project to do with my 5yr old. We didn’t have a cake pan so we used the baby cakes cake pop maker. It took a couple tries to get them cooked perfectly, the timer on the cooker wasn’t in sync with the recipe. It took about 5-6 minutes for perfection. I have been unable to buy store bought due to a dairy allergy so thank you far creating one, and for making them healthier by not frying. These are Delicious! What is their shelf life and since they ate drizzled with butter should leftovers be refrigerated? Hi, I was wondering if I used a 12 donut mini pan instead- would that change the baking time? I don’t get this but these didn’t work for me at all. I read the recipe a million times but this wasn’t nearly enough liquid to make anything thinner than a cookie batter. I thinned it out with more of the non dairy milk and pumpkin and they came out like glue-y pucks. No fun. Hi Jenn. I’m so sorry you had trouble with this recipe. The batter is very thick and should be spooned or piped into the donut molds. Adding more liquid will result in a rubbery outcome. I made these for breakfast this morning and after realizing that the only difference between the vegan and traditional version was the coconut oil, I decided to just use vegan butter (Earth Balance, to be exact). We really liked them since we still got the butter flavor of the traditional version! Wow- just made the vegan version and they are delicious!! The only change I made was I used 1/4 cup sugar and 1 TB cinnamon for the cinnamon sugar topping. That was enough. I will definitely make these again- thanks for the recipe! 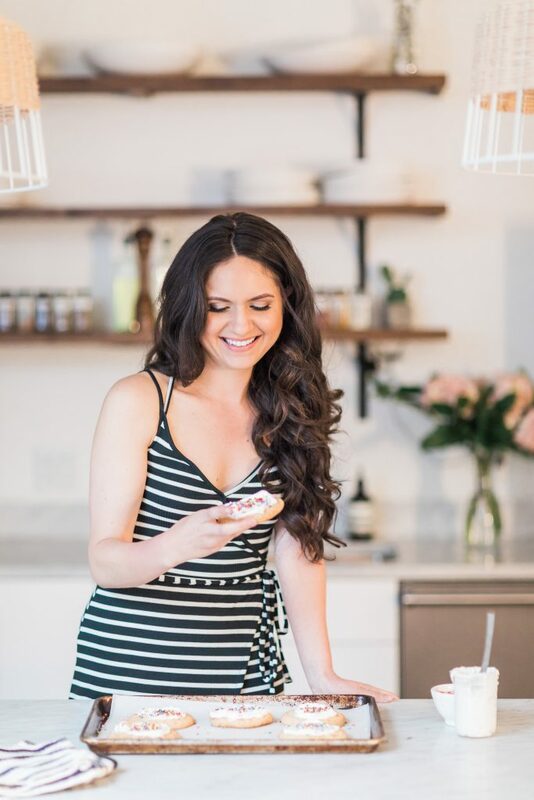 My husband and boys told me to tell you…THOSE ARE AMAZING!! !” Thank you for the great recipe. Will be making these again, and again, Next time, I might try a cream cheese glaze. Yummy! How can you store them? These donuts are best eaten the day they are made, but can be stored in an airtight container for up to 2 days. In the refrigerator or room temperature? FYI – Your vegan version says to melt coconut oil, but then instructs them to be dipped in butter in step 16. Typo? These are the best donuts ever!! My husband and I have made over and over. Thank you the recipe! How do you substitute the coconut oil? I have an allergy.